The Great Lakes Writers Festival is free and open to the public. 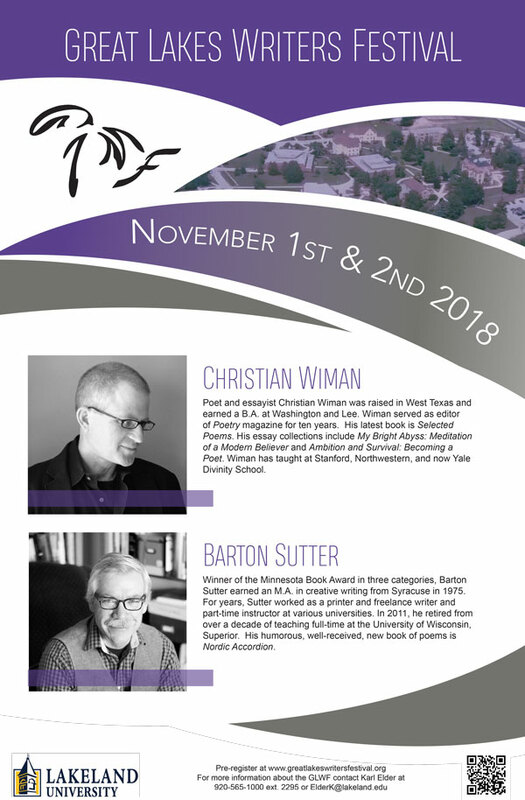 The annual event, hosted by Karl Elder, Lakeland’s Fessler Professor of Creative Writing, provides seasoned and emerging writers the opportunity to talk with peers, to discuss their work, and to learn from the pros in workshops. Each year highly esteemed writers join the Lakeland community for conversations about their art and craft. In the past, we have been proud to have, among other outstanding featured writers, Mark Strand and Billy Collins, both of whom have served as Poet Laureate of the United States. Community members are invited to participate in all events, but are especially encouraged to attend readings and workshops. See the Events page for information on workshops and contests. High school English and creative writing teachers are encouraged to bring students on Friday for an unforgettable experience. There is a contest just for high school students also. Lakeland University is easy to find, only minutes off HWY 43. About an hour north of Milwaukee, this quiet campus is the perfect setting for reflecting and renewing. While registration is free, please let us hear from you by Friday, October 13, 2017.